A reminder that, starting on 6th May, there will be a monthly Latin Mass on Wednesday evenings at 6.30pm at the Church of St Charles, Jarratt Street in Hull. The usual celebrant will be Fr Peter Mulholland. Yesterday, Palm Sunday, the noon Mass at St Wilfris's Church in York included the blessing of palms and the traditional Palm Sunday procession. The Passion was also sung in full, which made for a rather long Mass, but a great experience. It is the first time in my life that I have heard the Passion sung on Palm Sunday. Also, the Tract was sung in full to the tone of the Liber Usualis. The Mass was celebrated by Fr Stephen Brown who who was visiting. 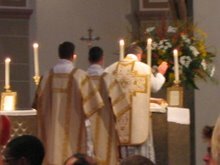 The liturgies of the Triduum will not be in the extraordinary form, so the next Latin Mass will be on Easter Sunday. It has been announced today that the new bishop of Arundel & Brighton is to be Bishop Richard Moth, currently Bishop for the Forces. He was appointed to that position in 2009 at the age of 50. Although this may seem young, it is recognised that this position requires fitness and is therefore suitable for a younger man. He was previously Chancellor and then Vicar General of the Archdiocese of Southwark. Now aged 56, he could still have 20 years ahead of him as a diocesan bishop. The post that he is taking on is likely to be particularly difficult, and it may be for this reason that a relatively young and fit man has been chosen. It may be for the same reason that the post has been filled within 6 months. The clergy of Arundel and Brighton often say that there has been a lack of leadership in the diocese in recent years, so Bishop Moth will have his work cut out for the next few months. I know nothing of Bishop Moth's attitude towards the traditional Mass. In fact, I know very little about Bishop Moth at all. There is very little about him on the internet. This is not necessarily a bad thing, as I can think of other episcopal appointments, where relatively unknown priests have turned out to be excellent bishops. There will be a sung Mass in the forma extraordinaria at 6pm on the Feast of the Annunciation at St Wilfrid's Church in York. 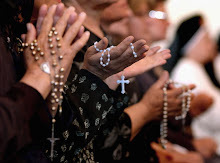 A day of instruction, devotion and intercession, based on the message given at Fatima in 1917. From 9am to 5pm with a traditional High Mass at 10.45. See website of St Wilfrid's Church for full details.